How long does it take Paul McCartney tickets to sell out? Not days. Not hours. Not minutes. Try under 10 seconds. When the Hard Rock Hotel & Casino put 4,000 seats on sale on February 14, 2009 to celebrate the opening of its new $60 million music venue, tickets sold at a rate of 600 seats a second — selling out in 7 seconds! It was the same case in 2010: McCartney’s December 17th show at London’s 100 Club also sold out in a matter of seconds. After the announcement of Paul McCartney’s On the Run tour, tickets for the July 15, 2011 show at Yankee Stadium were again sold out just moments after they were released. It’s safe to say Beatlemania is still Beatlemania. After Paul McCartney’s On the Run tickets flooded the secondary market, we took a look at average prices for five of Paul’s stops this summer. After the July 15th Yankee Stadium show sold out in record time, we weren’t surprised to find tickets listed on the secondary market at a whopping average price of $379. The significantly lower average price for July 16th at Yankee Stadium ($286) illustrates the economics of ticket sales, suggesting that the pressure of demand was somewhat released with the announcement of the second NYC show. Comerica Park and Bell Centre ticket prices for Paul McCartney are also very high considering the “get in” price on the primary market is considerably lower — but what is going on with Wrigley Field?! At an average price of $782, the Wrigley Field show is DOUBLE the average price of both the Yankee Stadium and Comerica Park shows. If I were in Chicago, I might even look into a bus ride up to (and hotel room in) Detroit for the show! 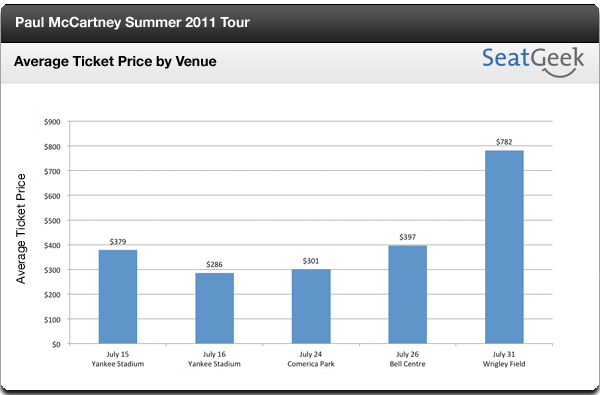 Let us know if you plan on going to see Paul McCartney @SeatGeek! Check this post out if you’re interested in hearing more about the Paul McCartney On the Run tour.